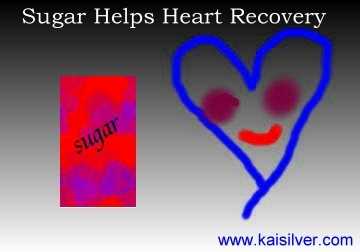 Sugar And Heart Recovery, Ribose A Type Of Sugar Can Hasten Recovery After Heart Surgery. A heart surgery is always a major operation, besides stressing out the patient and family members, a heart surgery also places substantial stress on the heart. A heart attack leads to a similar situation, the heart even if it can come back to normal condition - takes several weeks or even months to fully recover from the heart attack. Medical experts have for long looked at ways to shorten the period required for the patient to recover. A quicker recovery after a heart operation or heart attack, brings a number of benefits to the patient. In this report we will take about the results of a very important research project. As usual, initial testing for the project was done on animals. Doctors adminstered ribose, which is a type fo sugar to animals after a heart attack. The same process was repeated on animals during heart surgery too. The findings clearly showed that the period of recovery after the heart attack or heart surgery was shortened. The amount of time taken off the recovery route was very impressive. Before we get into details about the medical research project and it's findings, we would like to talk about a related subject. Sports coaches are aware of what severe training and physical exertion can do to the heart of the sportsman. At times, the heart can time substantial time to come back to normal - the athlete then experiences prolonged bouts of severe fatiguge. It is common for the athlete to intake some form of sugar drinks to shorten the period required to recover. This is a practice that is regularly followed and has been done for several decades. Now let us come back to the main issue in this interestig article. Medical experts have known for long that recovery after a heart surgery or a heart attack can be long and stressful. The effects of the trauma are visible not only on the patient and the affected heart but also, on the close relatives and family of the patient. Another problem with long recovery periods that accompany a heart surgery or a heart attack is the, prolonged risk associated with the recovery. The patient needs to be alert and be concious of various symptoms that could mean trouble for the heart. Strong medications need to be prescribed for a lengthy duration. We ofcourse need to consider the wide adjustments that are needed to be made by the patients in terms of work, profession daily routines. This itself could be a source of stress for the heart, something that could sometimes trigger a medical emergency. Such situations are not uncommon. This situation is generally present for many weeks or even months. There is an interesting case where, a business executive suffered from a heart attack. The patient recovered after 4 to 5 weeks, and was advised by the doctor to take up a hobby. This was meant to make the patient calmer and relaxed. The patient started playing chess to take his mind off work and business, He got so very engrossed in playing chess, that he suffered from another heart attack! This is a true incident, and is a warning for all of us. A medical experiment was conducted to study the effects of sugar on the heart. This was done on animals which had a heart attack or had undergone a heart surgery. Scientists used a form of simple sugar known as 'ribose' for the experiment. Ribose was administered to the animals durng heart surgery. Another test was conducted by administering ribose after a heart attack. It was evident that the duration of time required for recovery was reduced by an impressive amount. Many medical experts now agree that a similar test could be done on human beings. This will not be a straightforward test as, the overall condition of the patient needs to be considered too. For example increasing a sugar dose on a diabetic who has undergone a heart surgery, might require immense caution and care. To scientifically explain how sugar works to speed up the heart recovery, scientists studied the effects of a heart surgery or a heart attack on the heart. It was found that the heart became weak and almost 'lethargic'. You could say in simple terms that the heart seemed, reluctant to get to work. It was found that the administering of ribose, stimulates the heart to work more efficiently. This leads to a shorter period of recovery. There is some resemblence between a fatigued sportsmen being administed a sugar drink and this research project. The important thing that we would like to explain regarding sugar (ribose) and heart recovery is that, the whole research was perfomed in lab conditions only. It will be some time before the ribose theory on a human heart could be studied and confirmed. In any case, this is not something that you should try on your own. The heart is a complicated organ, any treatment done on the heart needs to be recommended and supervised by a medical expert. Recovery of the heart after a trauma caused by surgery or a heart attack, is a challenge for the doctor and the patient. While the patient needs ample support and encouragement at home, the family members themselves feel stressed out with anxiety and worry. However medical sciences have made great strides and this has resulted in a decreasing the rate of fatality. We do hope that you have found this report to be useful and interesting. Email us at easyrambler@rocketmail.com with your comments or suggestions.